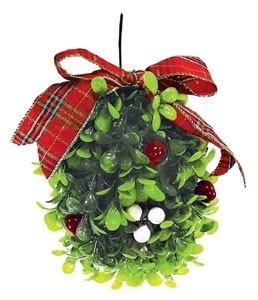 Mistletoe, a mysterious bundle of green leaves and berries often found hanging from doorways during the holiday season. This hemi-parasitic plant is steeped in tradition so much so, that couples dutifully exchange kisses beneath it in hopes of love, luck and perhaps just a little bit of magic! But have you ever wondered where the tradition of kissing under the mistletoe comes from? Well, I certainly have and set about to track down the origins of this age old tradition. As previously stated, mistletoe is hemi-parasitic and feeds off its host tree through the haustorium in which the plant attaches to the host by tapping into a branch to obtain its food and water. Although parasitic, mistletoe does retain some photosynthetic ability, hence the prefix hemi which enables the plant to stay green thoughout the winter months. The berries are very sticky and when consumed by birds leave a residue on the branches of the trees from their droppings. The smeared seeds found in the dropping then develop the thready like appendage that burrows into host plant and take root. It takes five years for the mistletoe to flower. Phewh.., more than you wanted to know about the botanical properties of mistletoe. Ok, lets get down to the fun part. Why do we kiss under the mistletoe? The oldest tradition I found was from Norse mythology. It was said that Frigga(Norse goddess of love) had a son named Balder. She made a deal with the other gods to protect her son from death by no earthly means. Loki(Norse god of mischief and all-around troublemaker) somehow circumvented the deal by fashioning an arrow from the branch of the mistletoe of which Frigga failed to include in her original bargain. Futhurmore, Loki convinced Hoor(Balder’s blind brother) to shoot the arrow killing Balder. Yikes, talk about sibling rivalry. But wait, it gets better or more melodramatic depending on your mindset. Frigga was so distraught she begged the other gods to restore her son’s life. They could not but they did manage to cast out Loki which of course led too many more stories of Loki’s mischief making. It was said that her grieving tears was able to restore Balder to life and the white berries of the mistletoe turned red. A testament indeed, to the triumph of a mother’s love. Another old Cornish traditon believes mistletoe was once a tree and the wood was used to build the cross from which Jesus was crucified. For its sins, the mistletoe is forever cursed to wander the world as a parasite, never to plant it’s roots in the soil of the earth. In many cultures, mistletoe is viewed as the “soul” of the tree. I suspect it’s ability to stay green year around played a strong role in that belief. It was commonly given as a treatment for fertility by the Druids and much care and secrecy went about in the yearly harvest. You know, by the light of the moon and much chanting and all the other spooky stuff. I suspect that the tradition of kissing under the mistletoe arises from such beliefs. In fact, it was believed that a young unmarried woman having been kissed under the mistletoe would be married within the year. And vice versa, if unkissed would remain a spinster for the same time period. Married couples would enjoy a happy marriage and have good luck and I am sure not many were willing to risk the alternative, hence much kissing abounded.